The surprise on Saturday during our monthly “Sunrise Surprise Stroll” was getting to see the new grizzly cubs, Montana and Scout, up close. 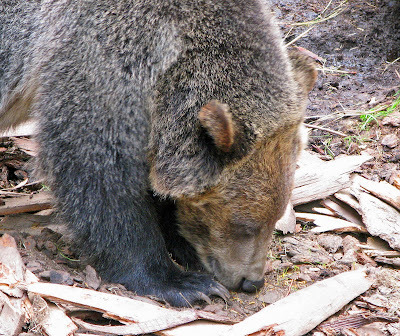 Todd took us behind the scenes to see where the cubs live when not on exhibit. 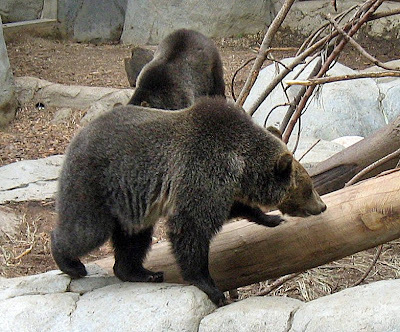 This was the first time visitors had been allowed “in back” with the new bears. 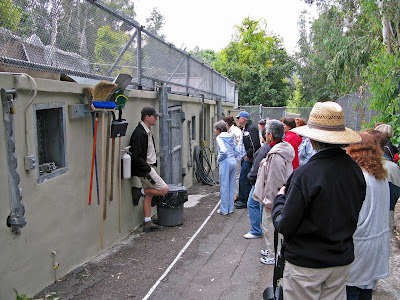 Then Todd took us around to the front to see the bears being released into their exhibit. He had hidden food treats around the enclosure and it was great fun watching the cubs scramble to find the best ones first. Fish seemed to be the favorite. The cubs are only one year old and very playful. 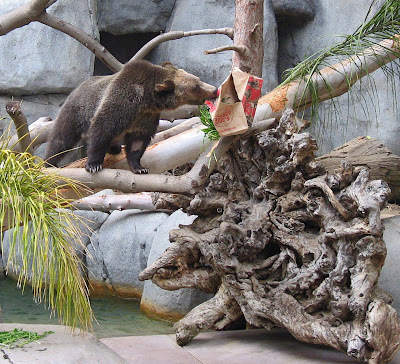 More details on the cubs are available here: San Diego Zoo blogs. I took this picture Saturday, April 5, 2008, during our monthly “Sunrise Surprise Stroll” at the San Diego Zoo. Our guide on these adventures is the remarkable Vik Cowan from the Zoo’s Education Department. Vik had a little trouble getting Sammy out of his cage. Seems the cage also holds his girl friend, Ria, and she does not like for Sammy to leave home. But Vik got him out and told us about Sammy while feeding him a variety of nuts. 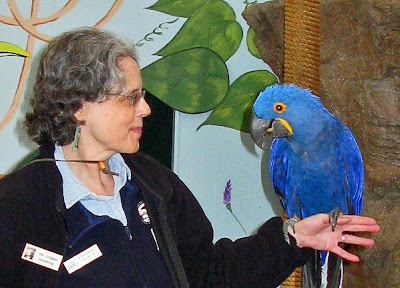 Sammy and Ria, both blue hyacinth mccaws, can be seen most days sitting on their perch inside the Children’s Zoo area.